On Thursday, March 3rd, Joe's Wine & Liquors will host its "Bang for Your Buck" wine tasting at Playhouse on the Square. All wines at the tasting are priced under $20. "It's the perfect opportunity to taste what you normally wouldn't," says Joe's general manager (and Flyer wine columnist) Michael Hughes. Literally ... Beer 30, tagged "Anytime is the right time!" Spotted at the Ike's on Park. A 30-can pack will set you back $14.99. Andrew Ticer and Michael Hudman look on as David Newman leads the demonstration. Last Saturday, on a balmy and beautiful afternoon, I watched David Newman butcher half a pig on the deck of Andrew Michael Italian Kitchen. I thought it would be, well, weird. And it had its moments. Hand saw. A pig foot falling off the table. Peeling off a layer of fat. But frankly, I found the experience informative and exhilarating. Newman’s affable personality helped. He works as a meat science professor at North Dakota State University, but I think he has a future as the rock star of home butchering. Newman can explain how to butcher a carcass with charisma and science. Plus he’s good looking. I’d say, move over, Alton Brown. In what can best be described as a feat of chemical engineering, Brim's Memphis-Style BBQ Rib Chips do indeed taste like meat. I bought these at the Tiger Mart on Jackson near the interstate. Spending $20 million on a single restaurant is big time, even for New York City, so on a recent visit, I was thrilled to have lunch at Lincoln Ristorante, the new showstopper at the Lincoln Center complex on the upper west side. Spotted these monster Florida avocados at the Fresh Market on White Station. Two for $4. On Thursday, February 24th, it’s the Beer Vs. Wine Dinner at the Brushmark at the Memphis Brooks Museum of Art. Each of the five courses will be paired with one wine and one beer. Diners will vote on their favorites, and the winner will be announced at the meal’s conclusion. Coworker and Vegan Crunker Bianca Phillips makes a cherry pie every year in honor of George Washington and Presidents Day. This tasty pie has a cherry filling, a whole wheat crust, and a crumble topping with coconut. Is warm weather making you dream about a fresh seasonal vegetables? Is so, why not try growing your own? Local farmer Ken Lansing of Windermere Farms is offering a beginning class for organic gardening on Saturday, February 26th, from 2 to 4 p.m. The cost is $25. Space is limited, so call ahead to reserve a spot. If you are pig crazy like me, but don’t know the difference between primal and offal, you might want to stop by Andrew Michael Italian Kitchen on Saturday for a lesson from a pro. David Newman, who teaches meat science at North Dakota State University in Fargo, will lead a butchering seminar from noon to 2 p.m. to explain (and demonstrate) how to break down a pig for nose-to-tail cooking. The seminar is free, and registration is not necessary. On my first visit to Bar None, I ordered the Dark & Stormy ($6). Made with Goslings rum and ginger beer, it is both spicy and sweet. For some reason, I decided that this was a day that demanded pie. But ... I wasn't exactly sure where to go. 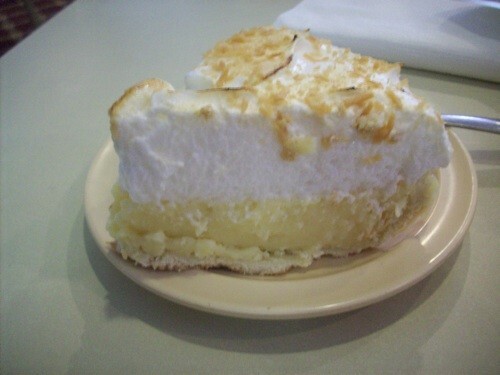 I ultimately got this piece of coconut meringue at The Cupboard, which was perfect. What's your go-to place for pie? Ryan Trimm of Sweet Grass is up for Food & Wine magazine's The People's Best New Chef, Southeast category. Readers vote online, choosing among 10 chefs from 10 regions. Trimm is the only Memphis chef nominated (and he faces stiff competition from Atlanta chef and Top Chef favorite Kevin Gillespie). Voting begins today and runs through March 1st. From instructables.com: instructions on how to make a Valentine's Day cake that looks like a real human heart that spurts blood when sliced! And, Muddy's Bake Shop is taking orders now for its extra-special VD treats, ranging from Love Potion cookies (shortbread with cherry essence glaze) to the Bitter with Baggage cupcake (chocolate cake with coffee icing and bittersweet chocolate chips). I've had the eggplant parmesan at Dino's before but never the eggplant parmesan sandwich ($5.99). Yesterday, I remedied that. It is what it is: breaded and fried cutlets of eggplant, cheese, loads of great marinara sauce — all between a toasted hoagie roll.